That’s how parents describe many of their children’s favorite electronic pastimes. But game makers and universities have been creating apps and software to promote science, technology, engineering and math (STEM) skills — so a little switcheroo could redirect your child from the mind-numbing (sorry, Prom Salon and Dragonvale) to the marvelous (hello, Can You Escape and Scratch!). 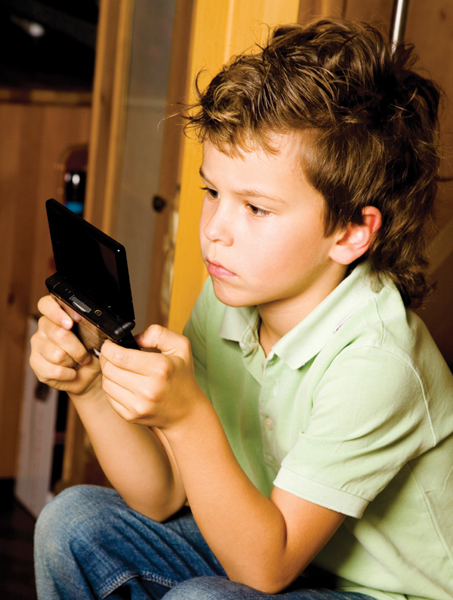 Video games and apps “can be good for kids, and promote traits like perseverance and cooperation” says Julia Cook, a national speaker on parenting and technology topics and author of children’s books about overcoming video game addiction, including the upcoming But It’s Just a Game. “The most important thing is for parents to know what their child is playing,” she says. Cook suggests parents talk to their children about the merits and drawbacks of different games. Are they educational? Are they violent? Do they engender creativity? Do they promote consumerism? Parents also need to establish clear rules about the types of games their children can play, and for how long. Discussing why certain games may be better or worse for them can plant the seed that helps the child make better decisions in the future, Cook says. Some STEM games help children learn math concepts, such as graphing or memorizing multiplication tables. In Math Ninja, available on iTunes, players solve math problems to defend a tree house against an angry tomato and its minions. Other games provide virtual hands-on activities. In the game X Construction, (available on Android and Kindle Fire), players construct a bridge over a valley and watch to see if it is structurally sound as a train crosses it. Girders under stress turn red, showing where the bridge is weak. Warning for parents: In the game, recommended for kids 10 and older, screaming is heard when the bridge collapses, but the sound can be turned off. Science concepts lend themselves well to software for children. In the Internet game Pandemic 2, used by the seventh-grade science class at Lakeside School in Seattle, students design a virus, bacteria or parasite and see how far it will spread across the globe. Players choose how the disease is spread, its symptoms and its resistance to environmental factors — and they soak up scientific concepts along the way. They learn, for example, that diseases with less visible symptoms spread before humans notice them. They learn that governments try to slow a pandemic’s spread by closing schools and cooperating to create a vaccine. Other games nurture crucial academic skills, such as critical thinking. Brookelyn, a fifth-grader from Redmond, loves Can You Escape. In the game, 10 differently decorated rooms represent increasingly complex game-play levels. Within each level, Brookelyn solves puzzles to unlock objects that help her escape from that room and get to the next level. “I like problem solving, and I have to be patient and remember where I saw different clues on different levels,” says Brookelyn. Brookelyn’s mother, Kris (the family asked that only their first names be used), looks for games that teach facts, such as country capitals, as well as those that nurture qualities such as creative thinking and perseverance — but that are also entertaining. “Brookelyn doesn’t realize she’s learning something, because she’s having fun,” says Kris. Brookelyn also likes a game called Prom Salon. This entails applying makeup products, changing eye and hair color, and making other changes to a teenager’s face to make the girl look attractive for her date. “We try to limit games like that,” says Kris. There are STEM games for every age. Young fans of the PBS television series Cyberchase can visit the Web page pbskids.org/cyberchase and use math games to help the characters from the show on their quests. Players can choose from about 50 games and solve problems in different topic areas, including addition, perimeters and areas, graphing, estimates and rounding. Teenagers and physics teachers might enjoy Portal 2, created by Seattle-area company Valve. In this game, players use the laws of physics to move through an increasingly complex 3-D environment. Creating their own video game may be the best STEM exercise of all for kids and teens. Building an app, game or online story requires analysis and critical thinking, along with patience, problem solving and resilience (because things don’t always work the way we want them to). Among the choices that instill programming basics, Scratch stands out. Created by MIT, Scratch provides the tools that allow players to make their own simple games and storylines, as well as more complex ones. An online Scratch library enables young innovators to share their creations. Scratch users can copy and modify the programs, and by examining the code that makes the programs run, they learn how to write their own. Julie Weed is a Seattle-based freelance writer for The New York Times, The Seattle Times and other publications. • Math Ninja: Use math skills to defend a tree house against a hungry tomato and his robotic army. • Can You Escape: Retrieve clues and solve puzzles to escape from one room to the next. • X Construction: Build a bridge that can carry a train safely across a valley. • Pandemic 2: Design a disease to spread throughout the globe. • Cyberchase: Use math skills in games related to the PBS television series. • Scratch: Create stories, games and animations to share with others using basic programming techniques. • Minecraft: Use blocks to create basic buildings or intricate worlds. • Magic Pen: Play with physics by guiding a ball to a flag using basic shapes, ramps and hinges. • Mathemagics — Mental Math Tricks: Learn tricks and techniques to solve math problems faster.